Next to the hotel is the Break Point Golf Club, a large training field ideal for those who want to learn how to play and for those who are already experienced and want to spend some time in total relax. The Break Point Golf Club offers the pleasure of learning and playing on a course with simple but challenging six holes, in a quiet and rural environment with a mild climate. The field is equipped for workouts, with night-lights, and is equipped with special equipment and golf-set for any commitments: to qualified players, as well as for beginners. 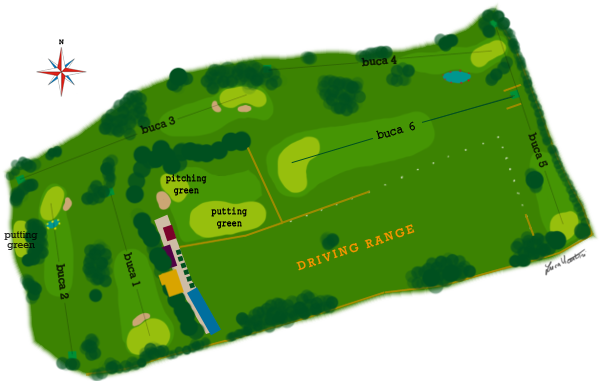 The Break Point Golf Club was founded in 1989 from an idea by Corrado Daldoss. Returned from the United States he decides to involve his friend Fabio De Carli, at the time owner of the Al Ponte Hotel in Pergine, to create a golf training field in the area adjacent to the hotel. Along with Federico Oss, Fulvio Zampedri and Renato Zanella, they started to visit some of the most beautiful areas of northern Italy (Orsini, Castel Conturbia, Garda Golf and Ca' of Olives). So in April 1990 the construction of the golf training field and the first three holes started. Later, with the purchase of additional land, the field was completed into the current 6-hole. Immediately after the opening the club counted 50 members under the teaching of the two professionals masters Malcolm Harrison and Jason Lewis. In 2000 a small club house was created, a meeting place for club members. In 2012 the night lighting system of the golf training field was created, in order to allow members to practice even during the hot summer evenings. In 2013 the new club house was completed. Even today, despite being a small golf training field, the club counts almost 340 members. In 2014 two new greens were created: the first of circa 300 square meters, used as a practice putting green and the second one, of about 200 square meters, is the new green of the sixth hole. More information is available on the Break Point Golf Club website.